Washington, D.C. | www.adc.org | November 16, 2018 – Earlier this week, the FBI released its annual hate crimes statistics report for 2017. Although the numbers are a drastic underestimate of the actual violence minority communities face in the United States, they nonetheless show a 17% increase in hate crimes. In particular, hate crimes against Arab Americans have risen by a disconcerting 100% since 2016. The American-Arab Anti-Discrimination Committee (ADC) documents that Anti-Arab hate crimes have more than doubled between the years 2016-2017. Given the fact that underreporting of hate crimes remains a major issue, these numbers are particularly alarming. These statistics are exceptionally concerning given that some of the current political leadership, including the President’s continued use of hate speech and racism. We as a nation witnessed the President justify the actions of white supremacists and attempt to implement policies that discriminate against entire communities. These actions cannot be separated from the rise in hate crimes we experience today. Furthermore, the President’s racist rhetoric has far from discouraged the perpetrators of such crimes, instead it validates that these crimes are in fact acceptable. Until the administration addresses the threat of white supremacy, these hate crimes will continue to increase. ADC is deeply concerned but not surprised by the lack of response and accountability from the administration to address the rise in these crimes. The data only affirms that it is imperative for the administration to uphold its duty to ensure safety and equality for all people irrespective of background. As a civil rights organization, ADC firmly upholds the principles stated in the US Constitution and we expect that the executive branch will set a national standard that the United States absolutely rejects racism, hate, and discrimination of any kind. 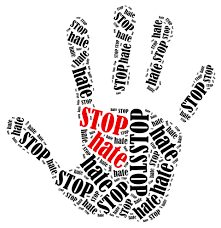 ADC is committed to continue to provide the necessary legal services to support all victims of hate crimes. We firmly believe in protecting the rights of victims and providing a safe space for victims to report hate crimes committed against them. ADC will continue to work with partners and our community to advocate against hate and racism for a better future.